Harold Edward Holt, CH (/hoʊlt/; 5 August 1908 – 17 December 1967), was an Australian politician and the 17th Prime Minister of Australia from 1966 to 1967. He was born in Stanmore, New South Wales and won a scholarship to study law at the University of Melbourne. Holt went into business as a solicitor, during which time he joined the United Australia Party (UAP). In 1935, aged just 27, he was elected for Fawkner. Holt spent 32 years in Parliament, including many years as a senior Cabinet Minister, but was Prime Minister for only 22 months before he disappeared in December 1967 while swimming at Cheviot Beach near Portsea, Victoria, and was presumed drowned. As Minister for Immigration (1949–1956), Holt was responsible for the relaxation of the White Australia policy. As Treasurer (1958–1966) under Robert Menzies, he initiated major fiscal reforms including the establishment of the Reserve Bank of Australia, and launched and guided the process to convert Australia to decimal currency. As Prime Minister, he oversaw landmark changes including the decision not to devalue the Australian dollar in line with the British pound, and the 1967 constitutional referendum in which an overwhelming majority of Australians voted in favour of giving the Commonwealth power to legislate specifically for indigenous Australians. He controversially expanded Australia's involvement in the Vietnam War, with the slogan "All the way with LBJ". Born in Stanmore, New South Wales on 5 August 1908, Holt was the elder son of Thomas and Olive (née Williams). He and his brother Cliff (Clifford Thomas Holt, born 1910), spent their early life in Sydney, attending three different schools. In 1918, Thomas Holt divorced Olive and went to work with the Hugh D. McIntosh, manager of the Tivoli theatre circuit. He became the Tivoli-J C Williamson representative in London and New York. Meanwhile, he enrolled his sons as boarders at Wesley College in Melbourne. In 1924, when Holt was sixteen, his mother died and he did not attend her funeral. A formative event was his singing performance at his school's annual Speech Night in December 1926. None of his family were present, and he never forgot the loneliness he felt that night. Harold and Zara Holt in 1950. Holt won a scholarship to Queen's College at the University of Melbourne and began his law degree in 1927. He excelled in many areas of university life – he won College 'Blues' for cricket and Australian rules football, as well as the College Oratory and Essay Prize. A member of the Melbourne Inter-University Debating team and the United Australia Organization 'A' Grade debating team, he was president of both the Sports and Social Club and the Law Students' Society. Holt graduated with a Bachelor of Laws degree in 1930. He was admitted to the Victorian Bar in November 1932 and served his articles with the Melbourne firm of Fink, Best & Miller, but the Great Depression meant that he was unable to find work as a barrister. His father, based in London at the time, wanted him to further his studies in England, but the worsening economy also made this impossible. Instead, in 1933, Holt went into sole practice as a solicitor. He later entered into a partnership, which became the firm of Holt, Graham & Newman, which Holt remained with until 1963. While at university, Holt had met Zara Kate Dickins. In 1934 they were contemplating marriage, but, after a quarrel, they split up. Zara travelled overseas, meeting Captain James Fell, a British Army officer stationed in India, whom she married in March 1935. Her first son Nicholas was born in 1937, followed by twin boys Sam and Andrew, born in 1939. Author Tom Frame has suggested that Holt was the father of the twins. Zara and Fell subsequently divorced, and she married Holt in 1946. Although they remained married until Holt's death in 1967, Zara later commented that Holt had had a number of extramarital affairs. Meanwhile, Thomas Holt married Lola Thring, the daughter of his business partner F. W. Thring, in 1936. He died in 1945. While developing his legal practice, Holt was drawn to politics and joined the Prahran branch of the United Australia Party (UAP) in 1933. At the 1934 federal election, Holt unsuccessfully contested the safe Labor seat of Yarra for the UAP, running against former Prime Minister James Scullin. In March 1935, he unsuccessfully contested the safe Victorian state Labor seat of Clifton Hill. Holt stood again for the federal House of Representatives on 17 August 1935, at a by-election for the marginally conservative seat of Fawkner, this time successfully. At age 27, he was one of Australia's youngest-ever MPs. Holt opposed socialism, but favoured a more equitable distribution of resources. From his maiden speech onwards, he emphasised the importance of physical fitness. In 1939, Holt's mentor Robert Menzies became Prime Minister after the sudden death of the incumbent Joseph Lyons and the short-term caretaker ministry of Sir Earle Page. Holt's energy, dedication and ability earned him rapid promotion and in April 1939, he was appointed Minister without Portfolio assisting the Minister for Supply and Development. In October 1939, he became Minister in charge of Scientific and Industrial Research, and during November–December 1939, he was Acting Minister for Air and Civil Aviation. In May 1940, without resigning his seat, Holt joined the Second Australian Imperial Force as a gunner, but a few months later three Cabinet ministers and several of Australia's top military staff were killed in an air crash in Canberra. Menzies recalled Holt from the army, appointing him Minister without Portfolio assisting the Minister for Trade and Customs, and his recall earned him the ironic nickname "Gunner Holt." In October 1940, Holt was elevated to Cabinet, becoming Minister for Labour and National Service, and one of his most significant achievements in this portfolio was the introduction of child endowment in 1941. In August 1941, a front-bench revolt forced Menzies to resign as Prime Minister. He was replaced by the Country Party leader Arthur Fadden. Holt was among those who withdrew their support, although he never revealed his reasons for doing so. In October 1941, the UAP was ousted by a no-confidence vote; the ALP leader John Curtin was invited to form a new government. By 1944, the UAP had effectively disintegrated and in 1945, Menzies formally established a new political party, the Liberal Party of Australia, and forged an enduring coalition with the Country Party. Holt was one of the first members to join the Liberal Party's Prahran branch. Holt as Minister for Labour at a Raymond Terrace Masonite factory in 1954. After eight years in opposition, the Coalition won the federal election of December 1949 and Menzies began his record-setting second term as Prime Minister. At this election, Holt saw his majority in Fawkner nearly disappear in the redistribution. He transferred to Higgins, one of several new seats created in the 1949 redistribution. The seat was created as a safe Liberal seat; it had been carved out of the wealthier portions of Fawkner. Holt won it easily. 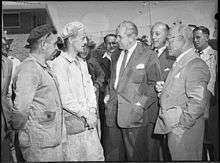 He was appointed to the prestigious portfolios of Minister for Labour and National Service (1949–1958; he had previously served in this portfolio 1940–41) and Minister for Immigration (1949–1956), by which time he was being touted in the press as a "certain successor to Menzies and a potential Prime Minister". In Immigration, Holt continued and expanded the massive immigration program initiated by his ALP predecessor, Arthur Calwell. However, he displayed a more flexible and caring attitude than Calwell, who was a strong advocate of the White Australia policy. He also had ministerial responsibility for the Melbourne Olympics in 1956. Holt excelled in the Labour portfolio and has been described as one of the best Labour ministers since Federation. Although the conditions were ripe for industrial unrest—Communist influence in the union movement was then at its peak, and the right-wing faction in Cabinet was openly agitating for a showdown with the unions—the combination of strong economic growth and Holt's enlightened approach to industrial relations saw the number of working hours lost to strikes fall dramatically, from over two million in 1949 to just 439,000 in 1958. The economy Holt inherited was growing strongly, aided by the opening of new iron ore mines. However, in 1959, inflation was running at 4.5% and Treasury was alarmed. Holt was reluctant to act, but in November 1960 introduced a deflationary package of tax changes. He also reluctantly agreed to an interest rate rise by the Reserve Bank. These measures became known as the "credit squeeze" or the "Holt jolt". The economy went into recession, but unemployment was still relatively low. The credit squeeze brought the Coalition dangerously close to losing the 1961 election, with the Coalition being returned with a precarious one-seat majority. There were calls for Holt to be sacked, but he retained Menzies' support. He later described 1960–61 as "my most difficult year in public life". Most of the deflationary measures were reversed in 1962. In later budgets, Holt retreated to his Queensland holiday home while it was being prepared. After presenting the budget, he took an overseas trip. In contrast to his colleagues, he travelled widely in South-East Asia, which he believed was key to Australia's future prosperity. Holt continued as federal Treasurer until January 1966, when Menzies finally retired. With Menzies' support, Holt was elected leader of the Liberal Party, thus becoming Prime Minister after having been an MP for almost 31 years. Malcolm Fraser (LP), Minister for the Army. 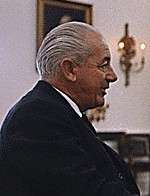 Holt's term in office covered almost exactly the tumultuous calendar years of 1966–67. His short tenure meant that he had limited personal and political impact as Prime Minister, and he is remembered mainly for the dramatic circumstances of his disappearance and presumed death. His untoward demise has tended to obscure the major events and political trends of his term in office, especially his role in maintaining and expanding Australia's military commitment to the Vietnam War. 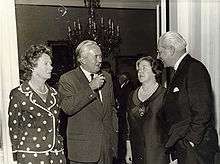 The Holts meeting with British Prime Minister Harold Wilson and Mrs Wilson in 1967. The transfer of power from Menzies was smooth and unproblematic, and at the federal election later that year, the electorate overwhelmingly endorsed Holt, giving the Holt-McEwen Coalition government a 41-seat majority, the largest in Australian history up to that time. They also won 57% of the two-party preferred vote, which is still the greatest winning margin at a federal election in Australian political history. Stylistically, Holt was more informal and contemporary than Menzies, and his wife accompanied him into the political spotlight. Political historian James Jupp says that, in domestic policy, Holt identified with the reformist wing of Victorian Liberalism. One of his most notable achievements was to initiate the process of breaking down the preferential White Australia policy by ending the distinction between Asian and European migrants and by permitting skilled Asians to settle with their families. He also established the Australian Council for the Arts (later the Australia Council), which began the tradition of federal government support for Australian arts and artists, an initiative that was considerably expanded by Holt's successor John Gorton. In the area of constitutional reform, undoubtedly the most significant event of Holt's time as Prime Minister was the 1967 referendum in which an overwhelming majority of Australians voted in favour of giving the Commonwealth power to legislate specifically for indigenous Australians and to include them in the Commonwealth census. In 1967 the Holt government made the historic decision not to depreciate the Australian dollar in line with Britain's depreciation of the pound sterling, a break with previous policy, which was strongly opposed by Country Party leader John McEwen. Prime Minister Harold Holt with US Secretary of Defense Robert McNamara at The Pentagon in July 1966. 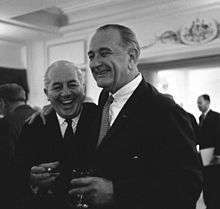 Prime Minister Harold Holt with U.S. President Lyndon B. Johnson in October 1966. During Holt's term in office, the Vietnam War was the dominant foreign policy issue. The Holt government significantly increased Australia's military involvement in the war and Holt vehemently defended U.S. policy in the region. 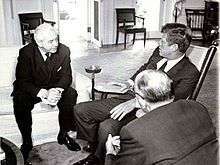 He also forged a close relationship with U.S. President Lyndon B. Johnson, whom he had first met in Melbourne in 1942. Whilst Holt stated that his friendship with Johnson was reflected in the strong relationship between Australia and the US, former Australian diplomat and foreign-affairs expert Alan Renouf was more cynical in his assessment of the situation. In the chapter on Vietnam in The Frightened Country, his 1979 book on Australian foreign policy, Renouf bluntly suggested that Holt was in effect "seduced" by Johnson, and notes that the Johnson administration criticized the Holt government for not doing enough and repeatedly pressured Australia to increase its troop commitment in Vietnam. On taking office, Holt declared that Australia had no intention of increasing its commitment to the war, but just one month later, in December 1966, he announced that Australia would treble its troop commitment to 4,500, including 1,500 National Service conscripts, creating a single independent Australian task force based at Nui Dat. Five months later, in May, Holt was obliged to announce the death of the first National Service conscript in Vietnam, Private Errol Wayne Noack, aged 21. Just before his disappearance, Holt approved a further increase in troop numbers, committing a third battalion to the war—a decision that was subsequently revoked by his successor, John Gorton. "You have in us not merely an understanding friend but one staunch in the belief of the need for our presence in Vietnam. "We are not there because of our friendship, we are there because, like you, we believe it is right to be there and, like you, we shall stay there as long as it seems necessary to achieve the purposes of the South Vietnamese Government and the purposes that we join in formulating and progressing together. "And so, sir, in the lonelier and perhaps even more disheartening moments which come to any national leader, I hope there will be a corner of your mind and heart which takes cheer from the fact that you have an admiring friend, a staunch friend that will be all the way with LBJ." Following his Washington visit Holt went on to London and in a speech there given on 7 July he was sharply critical of the UK, France and other U.S. allies that had refused to commit troops to the Vietnam War. On 20 October 1966, President Johnson arrived in Australia at Holt's invitation for a three-day state visit, the first to Australia by a serving U.S. President. The tour marked the first major anti-war demonstrations staged in Australia. In Sydney, protesters lay down in front of the car carrying Johnson and the Premier of New South Wales, Robert Askin (prompting Askin's notorious order to "Run over the bastards"). In Melbourne, a crowd estimated at 750,000 turned out to welcome Johnson, although a vocal anti-war contingent demonstrated against the visit by throwing paint bombs at Johnson's car and chanting "LBJ, LBJ, how many kids did you kill today?". In December, Australia signed a controversial agreement with the United States that would allow the U.S. to establish a secret strategic communications facility at Pine Gap in the Northern Territory. On 20 December 1966, Holt announced that Australia's military force in Vietnam was to be increased again to 6,300 troops plus an additional twelve tanks, two minesweepers and eight bombers. Holt fought his first and only general election as Prime Minister on 26 November 1966, focusing his campaign on the issue of Vietnam and the supposed Communist threat in Asia. Labor leader Arthur Calwell bitterly opposed Australia's part in the war and promised that Australian troops would be brought home if Labor won office, and opposition to overseas service by Australian conscripts had long been part of ALP policy. Australia's involvement in Vietnam still enjoyed majority popular support and Calwell's anti-war campaign did not garner much positive reaction from voters. The Coalition scored a stunning victory over the ALP, winning many former ALP seats and sweeping back into power with the largest parliamentary majority since Federation. The Liberal Party increased its numbers from 52 to 61, and the Country Party from 20 to 21, with Labor dropping from 51 to 41 seats, and one Independent. Among the new members elected was future federal Treasurer Phillip Lynch. In June, Holt travelled to London via Canada, where on 6 June he opened the Australian Pavilion at Expo 67 in Montreal; on the return journey, the Holts stayed with the Johnsons at the presidential summer resort, Camp David, in Maryland. In October the government became embroiled in another embarrassing controversy over the alleged misuse of VIP aircraft, which came to a head when John Gorton (Government Leader in the Senate) tabled documents that showed that Holt had unintentionally misled Parliament in his earlier answers on the matter. Support for his leadership was eroded even further by his refusal to sack the Minister for Air, Peter Howson, in order to defuse the scandal, fuelling criticism from within the party that Holt was "weak" and lacked Menzies' ruthlessness. Much of the blame for the episode within the Public Service was visited upon Sir John Bunting, Secretary of the Prime Minister's Department, although other figures such as the Deputy Secretary Peter Lawler were able to protect themselves. One of John Gorton's first acts upon becoming Prime Minister in January 1968 was to sideline Bunting by creating a separate Department of the Cabinet Office with Bunting as its head, and replaced him with Lenox Hewitt. In November 1967, the government suffered a serious setback in the Senate election, winning just 42.8 per cent of the vote against Labor's 45 per cent. The coalition also lost the seats of Corio and Dawson to Labor in by-elections. Alan Reid says that, within the party, the reversal was blamed on Holt's mishandling of the VIP planes scandal. Disquiet was growing about his leadership style and possible health problems. On the morning of Sunday 17 December 1967, Holt, his neighbour and rumoured lover Marjorie Gillespie, her daughter Vyner, Vyner's boyfriend Martin Simpson, and Gillespie family friend Alan Stewart drove down from Melbourne to see the lone British yachtsman Alec Rose sail through Port Phillip Heads. Around noon, the party drove to one of Holt's favourite swimming and snorkelling spots, Cheviot Beach on Point Nepean near Portsea, on the eastern arm of Port Phillip Bay. Holt decided to go swimming, although the surf was high and fierce. Holt began swimming, but he soon disappeared from view. Fearing the worst, the others raised the alert. A large contingent of police, Royal Australian Navy divers, Royal Australian Air Force helicopters, Army personnel from nearby Point Nepean and local volunteers converged on the beach. This quickly escalated into one of the largest search operations in Australian history, but no trace of Holt could be found. Two days later, on 19 December 1967, the government made an official announcement that Holt was thought to be dead. The Governor-General Lord Casey sent for the Country Party leader and Coalition Deputy Prime Minister John McEwen, and he was sworn in as caretaker Prime Minister until such time as the Liberals elected a new leader. Holt was a strong swimmer and an experienced skindiver, with what his biographer Tom Frame describes as "incredible powers of endurance underwater". However, his health was far from perfect at the time of his death—he had collapsed in Parliament earlier in the year, apparently suffering from a vitamin deficiency, and this had raised fears among some senior Liberals that he might have a heart condition. In September 1967, Holt had suffered a recurrence of an old shoulder injury, which reportedly caused him agonising pain, and for this he was prescribed strong painkillers. He ignored recent advice from his doctor Marcus de Laune Faunce not to play tennis or swim until the shoulder healed and reportedly obtained a prescription for morphine from another doctor. Tom Frame also records that Holt had already got into trouble twice while skindiving earlier in 1967—on the first occasion, while snorkelling at Portsea in May, he got into severe difficulties because of a leaking snorkel and had to be pulled from the water by friends, gasping for breath, blue in the face, and vomiting seawater. A memorial service held at St Paul's Anglican Cathedral in Melbourne on 22 December was attended by a number of international dignitaries including President Johnson, Charles, Prince of Wales, and British Prime Minister Harold Wilson. 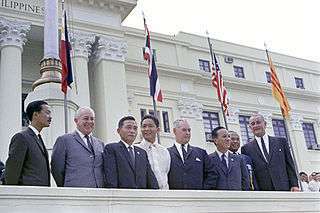 Among the many Asian leaders were Nguyễn Văn Thiệu, President of South Vietnam and Park Chung-hee, President of South Korea. It was also one of the first events to be transmitted from Australia to other countries via satellite. Media speculation focused on the possibility that Holt took his own life. Journalist Ray Martin made a documentary, Who Killed Harold Holt?, screened in November 2007, which suggested that Holt might have committed suicide. The Bulletin magazine featured a story supporting the suicide theory. In support of the view, The Bulletin quoted fellow cabinet minister Doug Anthony who spoke about Holt's depression shortly before his death. The suggestion of suicide was emphatically rejected by Holt's son Sam, by his biographer Tom Frame, and by former prime minister and Holt's Cabinet colleague at the time, Malcolm Fraser. On 23 October 2008, ABC Television broadcast the one-hour docu-drama The Prime Minister is Missing, starring Normie Rowe as Holt. This program covered much of the same ground as Martin's documentary, but rejected Martin's suggestion that Holt had committed suicide, stating that he was a vocal 'life affirmer'. The documentary also noted that Holt was suffering from a shoulder injury and had been advised not to swim. In 1983, an alternative theory was advanced by writer Anthony Grey who suggested Holt had been a spy for the People's Republic of China and a Chinese submarine had picked him up. This theory was widely ridiculed. No official federal government inquiry was conducted, on the grounds that it would have been a waste of time and money. Neither was an inquest held at the time because Victorian law did not provide any mechanism for reporting presumed or suspected deaths to the Victorian Coroner. However, the Commonwealth and Victoria Police compiled a 108-page report into the disappearance, including statements from all eyewitnesses and details of the search operation. The law in Victoria was changed in 1985, and in 2003 the Victoria Police Missing Persons Unit formally reopened 161 pre-1985 cases in which drowning was suspected but no body was found. Holt's son Nicholas Holt said that after 37 years there were few surviving witnesses and no new evidence would be presented. On 2 September 2005, the Coroner's finding was that Holt had drowned in accidental circumstances on 17 December 1967. Holt's disappearance triggered a crisis in the Coalition government. Liberal deputy leader and Treasurer William McMahon planned a party room meeting on 20 December to elect a new leader, intending to stand for the position himself. However, this was pre-empted by the Country Party leader and Deputy Prime Minister John McEwen who publicly declared on the morning of 18 December that he would not serve in a McMahon government. (He and McMahon had had a long-running dispute about trade policies.) On 19 December, after discussions with McEwen and various Liberal MPs, the Governor-General Richard Casey commissioned McEwen as caretaker Prime Minister on the understanding that his commission would continue only so long as it took for the Liberals to elect a new leader. The Liberal leadership ballot was rescheduled for 9 January 1968. As it turned out, McMahon did not stand, and Senator John Gorton was elected, replacing McEwen as Prime Minister on 10 January 1968. In terms of party politics, one of the most significant features of Holt's brief tenure as PM is that his unexpected death triggered the beginning of an unprecedented period of turmoil within the Liberal Party and a rapid decline in the Coalition's electoral fortunes. For twenty-two years, from its founding in 1944 to his retirement in 1966, the Liberal Party had had only one leader, Robert Menzies. After Menzies' retirement, the party had three leaders in six years: Holt, Gorton and William McMahon. In December 1969, the ALP under Gough Whitlam came within four seats of ending the Coalition's hold on power before winning a convincing victory in 1972. Harold Holt is most famously commemorated by the Harold Holt Memorial Swimming Centre in the Melbourne suburb of Glen Iris. The complex was under construction at the time of Holt's disappearance, and since he was the local member, it was named in his memory. The irony of commemorating a man who is presumed to have drowned with a swimming pool has been a wry source of amusement to many Australians. ↑ "Holt", Random House Webster's Unabridged Dictionary, Random House, 2001. ↑ Frame, Tom (2005). The Life and Death of Harold Holt. Allen & Unwin / National Archives of Australia. pp. 26–27. ISBN 1-74114-672-0. 1 2 Frame, Tom (2005). The Life and Death of Harold Holt. Allen & Unwin / National Archives of Australia. pp. 5–6. ISBN 1-74114-672-0 – via Amazon.com "Look Inside". 1 2 3 4 5 6 7 8 9 10 11 12 13 Hancock, I. R. (1996). "Holt, Harold Edward (1908–1967)". Australian Dictionary of Biography. Canberra: Australian National University. ↑ Frame, Tom (2005). The Life and Death of Harold Holt. Allen & Unwin / National Archives of Australia. p. 29. ISBN 1-74114-672-0. ↑ Frame, Tom (2005). The Life and Death of Harold Holt. Allen & Unwin / National Archives of Australia. pp. 28–31. ISBN 1-74114-672-0. ↑ Frame, Tom (2005). The Life and Death of Harold Holt. Allen & Unwin / National Archives of Australia. pp. 20,335. ISBN 1-74114-672-0. ↑ Frame, Tom (2005). The Life and Death of Harold Holt. Allen & Unwin / National Archives of Australia. pp. 30–31. ISBN 1-74114-672-0. ↑ Frame, Tom (2005). The Life and Death of Harold Holt. Allen & Unwin / National Archives of Australia. pp. 32–36. ISBN 1-74114-672-0. ↑ Frame, Tom (2005). The Life and Death of Harold Holt. Allen & Unwin / National Archives of Australia. pp. 35, 38. ISBN 1-74114-672-0. ↑ Frame, Tom (2005). The Life and Death of Harold Holt. Allen & Unwin / National Archives of Australia. pp. 36, 39. ISBN 1-74114-672-0. ↑ Hawkins, John. "Harold Holt: urbane treasurer". Economic Roundup Issue 1, 2012. The Treasury. p. 62. ↑ Hawkins, John. "Harold Holt: urbane treasurer". Economic Roundup Issue 1, 2012. The Treasury. p. 63. ↑ Hawkins, John. "Harold Holt: urbane treasurer". Economic Roundup Issue 1, 2012. The Treasury. pp. 63–64. 1 2 Hawkins, John. "Harold Holt: urbane treasurer". Economic Roundup Issue 1, 2012. The Treasury. pp. 66–67. ↑ Hawkins, John. "Harold Holt: urbane treasurer". Economic Roundup Issue 1, 2012. The Treasury. pp. 64–65. ↑ Hawkins, John. "Harold Holt: urbane treasurer". Economic Roundup Issue 1, 2012. The Treasury. pp. 65–66. ↑ Hawkins, John. "Harold Holt: urbane treasurer". Economic Roundup Issue 1, 2012. The Treasury. p. 66. ↑ Hawkins, John. "Harold Holt: urbane treasurer". Economic Roundup Issue 1, 2012. The Treasury. p. 68. ↑ Hawkins, John. "Harold Holt: urbane treasurer". Economic Roundup Issue 1, 2012. The Treasury. pp. 64, 69. ↑ Hawkins, John. "Harold Holt: urbane treasurer". Economic Roundup Issue 1, 2012. The Treasury. pp. 63, 70. ↑ Hawkins, John. "Harold Holt: urbane treasurer". Economic Roundup Issue 1, 2012. The Treasury. p. 70. ↑ "National Archives of Australia – Australia's Prime Ministers – Harold Holt – In Office". Primeministers.naa.gov.au. Retrieved 25 April 2010. ↑ "National Museum of Australia – Pop goes Australia". Nma.gov.au. 6 June 1967. Retrieved 25 April 2010. ↑ "In office – Harold Holt – Australia's PMs – Australia's Prime Ministers". Primeministers.naa.gov.au. Retrieved 25 April 2010. 1 2 King, Gilbert (4 January 2012). "The Prime Minister who Disappeared". Smithsonian magazine. Retrieved 25 January 2016. ↑ Chalmers, Rob (2011). Inside the Canberra Press Gallery: Life in the Wedding Cake of Old Parliament House. Australia: Australian National University. p. 139. ISBN 1921862378. Retrieved 1 February 2016. ↑ "Harold Holt: GNT History, ABC, 22 September 2003". Abc.net.au. Retrieved 25 April 2010. ↑ Norington, Brad (14 November 2007). "Holt 'may have killed himself'". The Australian. Retrieved 15 November 2007. ↑ "Frame, Fraser reject Holt suicide claim". Sydney Morning Herald. 13 November 2007. Retrieved 15 November 2007. Dunn, Mark (15 November 2007). "Harold Holt son rejects suicide theory". Herald Sun. Retrieved 15 November 2007. ↑ "Coroner rules Holt conspiracy theories 'fanciful'". Australian Broadcasting Corporation. 2 September 2005. Retrieved 15 November 2007. ↑ "Harold Holt Swim Centre". Stonnington.vic.gov.au. Retrieved 12 January 2012. ↑ "It's an Honour". Itsanhonour.gov.au. 8 June 1968. Retrieved 25 April 2010. Frame, Tom (2005). The Life and Death of Harold Holt. Allen & Unwin / National Archives of Australia. ISBN 1-74114-672-0. Griffen-Foley, Bridget (2003). Party Games: Australian Politician and the Media from War to Dismissal. Text Publishing, Melbourne. ISBN 1-877008-64-8. Inglis, Kenneth S. (1983). This Is The ABC. Melbourne University Press. ISBN 0-522-84258-5. Renouf, Alan (1979). The Frightened Country. Macmillan Australia, Melbourne. ISBN 0-333-25248-9.